So, hardly a day goes by when I don’t hear from some kind of scammer. Sometimes I just hang up or delete their message. Other times, I like to string them along a bit before I toss them aside (if I have enough detail, I send them along to the proper authorities, of course). “Edward” also called me at the same time as he sent the text. So, I called the number back and it was generated through a free text/phone service. Further, this “federal” employee was calling me from “New York” on a Massachusetts phone number. Way to start a scam, Edward. He delayed in responding, so I thought it was a good opportunity to throw him a curve ball. I claim that I am NOT Christine since, if the USPS has a package to deliver to Christine and I am NOT her, he should move on. Screened Ad: Survey Takers – Springboard America: Get paid to answer survey questions. Legitimate. Pays cash or (if you prefer) Visa cards or Amazon gift cards. Work from anywhere. Now, Edward wants to prove to me he has something for me so he sent me these pictures. Um… Eddie… buddy… the USPS does NOT open packages to show recipients what’s inside. It doesn’t work that way here in the States. 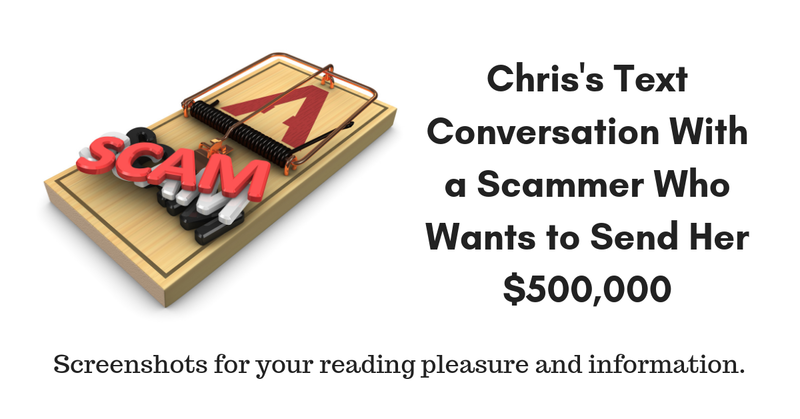 I tell him I am NOT a scam victim, but that doesn’t deter him. He goes on to explain that there’s $500,000 loaded on a card for me and I can withdraw $900 daily. Is it just me, or does our little Eddie seem to know an awful lot about the contents of a package that he is merely tasked with delivering? Well, even though I have clearly told him I am not a victim, I tell him I want the money and ask him what he needs from me…. And now the scam comes to light. He wants me to wire him money for delivery of the package. He wants me to send him $100. First things first – the fee jumped up to $150 as soon as I continued the conversation! I want you to notice the name of the recipient – Nguessan Hippolyte Gbatta. Now, check this out. Remember that picture that Ed told me was of “your ATM debit card”? Well, I blew it up to read the imprinted name that’s visible from the other side and guess what… the name on the card is Nguessan Hippolyte Gbatta. Yeah, our scammer just tipped his hand. “My” card his HIS name on it. Even though he is telling me to send it with a Dallas, TX address on it, he plans to get the transaction ID number and pick it up in Africa. Now that I have the details, he wants to make it happen immediately, so I play along. I tell him again I am not a victim and he avoids it altogether. He figures he’s got his next victim on the ropes and doesn’t want to risk losing me. By the way, don’t you just love the language in that final comment – “once you pay up.” Eddie went from USPS worker to gangster in 4 minutes! Screened Ad: Poll Takers – InboxDollars: Work from anywhere. $5 signup bonus. Pays in cash rather than points. Scammers who use wired funds usually tell their victims not to tell the cashier what you are doing. That’s because Walmart, MoneyGram and others have trained their folks to be on the lookout for scam transfers. So, I ask him about it to see what he’ll say. I guess he didn’t get the Scammer 101 How-To memo because what he as told me to tell them (in the next frame) is a red flag to the tellers. He’s been waiting for picture of the confirmation so he can go grab the money, so I sent him a picture. Ooops! If I had not been in a hurry I would have gone into an extensive dialogue about my cat, Bean, and how happy she is that we’re about to be rich! He was not amused by the photo. You know he’s somewhere near a MoneyGram counter waiting for the confirmation number. NOTE: IF YOU ARE OFFENDED BY SWEARING, PLEASE DO NOT SCROLL DOWN! Stay safe out there, RRRebels! We love you and we’ve got your back!! This entry was posted in Scams and tagged scammer. Bookmark the permalink.